Psilocybe Cubensis Amazonian aka PES Amazonian aka Amazon or PESA or what ever the name it is sold or known as. This strain is a real monster in regards of size - fruits of 30cm have been reported! Pacifica Exotica Spora, the first company to sell this strain used to name the spores after the location where they had been found, so it might originate from the Colombian Amazon. 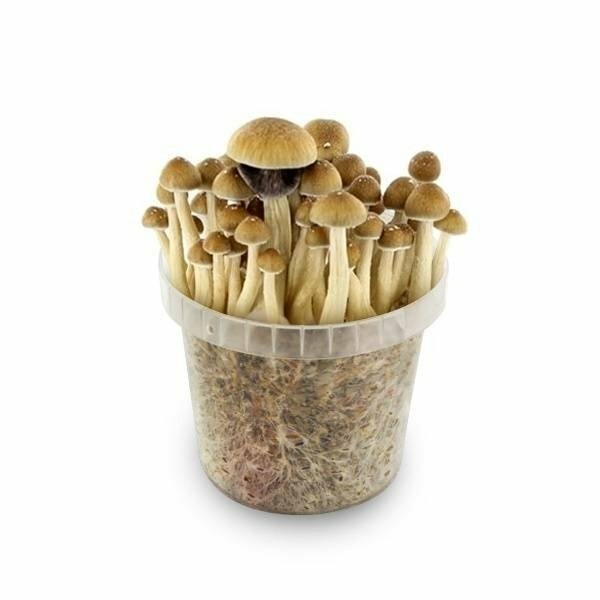 Supa Gro - 100% Mycelium Kit "Amazonian"
Psilocybe Cubensis Amazonian has many aliases and is sold under names like PES Amazonian, Amazon or PESA. Apart from the different names, the results of working with these kits are amazing - this cubensis variety is a true monster in regards of size, some growers reported fruit-bodies of 30cm (and occasionally more). The first company to sell this strain, Pacifica Exotica Spora (PES), used to name their spores after their origin, so this one might have been found in the Colombian Amazon region. These grow kits are filled with a 100% colonized rye cake and enough humidity to start growing your own Psilocybe Cubensis Amazonian immediately after receiving them. The most work on your behalf will be - waiting. And after a little spraying every now and then you'll harvest a your fresh mushrooms in no-time. Note: Psilocybe Cubensis Amazonian is a fast growing variety and is therefore prone to hollow stems, but this only reduces the mass, NOT the potency of the fruits.